Observers were quick to note on Twitter the agency cut short its livestream of acting Administrator Andrew Wheeler's announcement that the agency would be revising greenhouse gas emission standards for new and modified power plants (E&E News PM, Dec. 6). 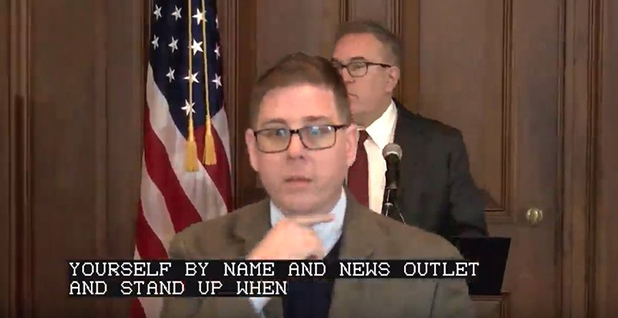 As Wheeler prepared to take questions from reporters, EPA spokesman John Konkus was seen signaling to the camera to cut off filming. Here is a transcript of the Q&A section of yesterday's event that was not broadcast. Some portions of the remarks from a recording were not audible from an E&E News reporter's position at the back of an auditorium at EPA headquarters. Reporter: Today's proposal — I think we understand there will be more carbon emitted from these coal power plants — how does this proposal not fly in the face of the recent government report put out by the Trump administration that urgently called for curbing carbon emissions from coal-fired plants? Wheeler: First of all, our analysis shows that the proposal would not result in significant CO2 emission changes or costs, and that is in the proposal and you are welcome to take a look at it, comment on it to see if our data is correct. But we don't see an increase in CO2 costs. And the important thing to remember is this is not, we're following the Clean Air Act. The Clean Air Act requires us to take a look at what is adequately demonstrated as far as clean coal technologies is concerned. CCS is still important. We still support CCS, we support investment there, but it is not adequately demonstrated for purposes of the Clean Air Act. So what we are doing is setting a standard on what is adequately demonstrated, which is what is required under the Clean Air Act. Reporter: But to be clear, the Obama rule you are rolling back called for the emissions rate to be 1,400 pounds, you are calling for it to be 1,900 pounds, so by definition, that would be allowing more carbon emissions. So my question is, is this the sort of situation where you are ignoring the government report, which makes clear we need to curb carbon emissions? This proposal seems to be doing the exact opposite. Wheeler: We are not ignoring the government report. We're still looking at the report; I was just briefed on it this morning by some of our career scientists. A lot of what the media is focused on last week was the worst-case scenario. We will be taking a look at the report and the information provided in it. At the same time, we have statutory obligations passed by Congress in the Clean Air Act that we have to follow, and we are following the law. And as I said, [inaudible] we are going to do what the Clean Air Act tells us to do. The Clean Air Act also said that it has to be adequately demonstrated, and that is what we are doing today. Reporter: Following up then, can you say how enabling new coal plants protects human health and the environment? Wheeler: Coal is one of the cheapest forms of electricity. And having cheap electricity, affordable electricity protects human health, absolutely. There have been studies that have shown that if you have cheaper forms of electricity, you are able to afford in the winter heat, in the summer cool [inaudible], I think that's an important aspect of protecting human health. Again, what we are doing here today is following what the Clean Air Act tells us to do. We're following the law, and that is to set a standard of what is adequately demonstrated. Reporter: A lot of utilities say they are not very interested in coal. Do you have sense of the level of interest? What gives you confidence that you are actually going to see the development of new coal plants? Wheeler: Whether or not new coal plants are built in this country is a decision that the utility industry will make. We are not trying to pick winners and losers. We are not trying to tip the scale one way or the other. What I will tell you is when the United States develops cleaner technologies, those technologies are exported to other countries, so if we develop cleaner coal technologies, we will reduce pollution. I would love to see coal both in China and India meet our standard that we are proposing today, because they don't meet it today. So by allowing U.S. ingenuity to continue to develop, new technologies, by providing new technologies that can be exported to other countries so other countries can have cleaner coal-fired power plants. The technologies designed here can be exported to other places, and that can bring down CO2 emissions worldwide. Reporter: The proposal specifically asks for comment on the endangerment finding and whether it actually applies to coal-fired power plants under this category. It says it might not necessarily apply to new sources. Wheeler: I'll have Mandy answer that. Mandy Gunasekara, assistant administrator for EPA's Office of Air and Radiation: The proposal doesn't take comment on the endangerment finding, it takes comment on the threshold issue of contribution. And under Section 1 of the Clean Air Act [inaudible], that comes to a contribution factor that is requisite in terms of triggering [inaudible]. So under Title 1 of the Clean Air Act, there is [a] significance requirement, and we are asking about that particular issue. Reporter: It seems odd that you are saying few to no coal plants will be built, even though you are making this change, so therefore maybe the endangerment finding shouldn't apply to new coal plants at all. Wheeler: I don't think that's what we're saying. Again, what we are saying is that the standard was adequately demonstrated, in the hope that industry could develop cleaner coal technologies. And whether those technologies would be deployed here or elsewhere, that doesn't matter. Hopefully they will be deployed in countries [inaudible]. Reporter: Can you identify some of these technologies that you are talking about? And my understanding is there are coal plants that have been built within the last decade that hit a lot lower than the 1,900 that you are setting. Wheeler: You have to look across the board at what happened before. We are taking comment on what is the right technology to set the standard for and what is the right limit. But again, going back to the original Obama proposal, this regulation was set for CCS, which we don't believe is adequately demonstrated. Reporter: A report from EPA said black Americans suffer disproportionate exposure to fine particulate matter, [which] causes health problems and early mortality, and [a] disproportionate number of black Americans actually live near coal and fossil fuel plants. The electricity is cheaper, but the exposure to pollutants is higher. Wheeler: Well, we have a separate standard and regulatory programs to address fine particulate matter under the [National Ambient Air Quality Standards] program. We're continuing to look at that [inaudible]. That is a separate regulatory program. [Inaudible] ... there are different regulatory programs, we are still looking at fine particulate matter, we have a standards set. We're trying to get as many [inaudible] as we can [inaudible]. We're trying to look at how we can provide more tools to help poor communities, but that's a separate regulatory program. Reporter: I just wanted to ask you more on the "adequately demonstrated" question here. Since the Obama-era standard was put in place, we've seen the Petra Nova plant in Texas, and we've of course had Congress pass the 45Q tax credit [for carbon capture and sequestration], that could make it significantly cheaper to deploy. Given those things, how do you stand by that this is not adequately demonstrated? Wheeler: Well, just because the tax credits are passed doesn't mean the technology is then deployed yet. People are still working on it. But the encouraging thing [inaudible] Congress has the 45Q program that they authorized to continue investment and development of that technology. But as of today, I don't think anyone will say that CCS is adequately demonstrated in order to be put in place by regulation here in the United States. Reporter: I wanted to follow up on the level of interest from industry. Do [you] have at least an approximate projection of interest, like the number of potential coal plants, the amount of potential investment and how it will add to the economy in terms of jobs? Wheeler: No, that's not the role of EPA. Again, going back to what the law requires of us, we have to set a standard based on what was adequately demonstrated. We're allowing the free market and industry to come up with technologies, and move forward [inaudible]. Reporter: [Inaudible] What is the timeline you would like to see for the construction of some of these newer plants? Reporter: I'm wondering if you could explain a little more your reasoning behind the technology export point. How does lifting emissions on U.S. coal plants lead to the development of cleaner energy technologies to be exported? Ostensibly, you could still be doing that now. I don't think a lot of people expect a lot of coal plants built with those technologies anyway. Wheeler: Well, the original Obama proposal would only have allowed CCS. So that's where all the research dollars, that's where the industry is focusing on how to make CCS financially, technically feasible to be developed here. We are supposed to set the standards that are adequately demonstrated, and that is what we are doing. And I believe, and a lot of the industry told us, that if we re-up the regulatory structure so people can invest in different technologies that might take us further. [inaudible] China is still building coal-fired power plants. There are new coal-fired power plants being built in India, Indonesia. Those countries aren't building their coal-fired power plants to the same level of protection that we have here in the United States. So by continuing to incentivize people to invest in different technologies through the regulatory process, hopefully that will create an export market for our technologies so that Third World countries can use cleaner technologies. Wheeler: And it's the new plants being built aren't necessarily being built to the same standards as the United States, but we want to encourage that technology. Reporter: So I just want to be clear, the motivation of using such technology in the United States is what EPA expects to drive innovation that could be exported. Wheeler: Yes, if I understood your question correctly, yes.